^ 1.0 1.1 内蒙古人民党官方网站. [2018-08-31]. （原始内容存档于2018-06-15） （中文（简体）‎）. ^ OVERVIEW OF INNER MONGOLIAN SEPARATIST ORGANIZATIONS ABROAD. Southern Mongolian Human Rights Information Center （英语）. ^ 告内蒙古人民同胞书. 内蒙古人民党. 1997-03-20. （原始内容存档于2013-05-03）. ^ 令人吃惊，居然还有一个“蒙独”. 乌有之乡. 2016-11-17 [2017-01-01]. 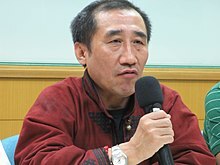 ^ Fate of key jailed China Mongol activist unclear. 2010-12-12 （英语）.